For other uses, see Pretzel (disambiguation). A pretzel ( listen (help·info)) (German: Breze(l)) ( listen (help·info)) is a type of baked bread product made from dough most commonly shaped into a twisted knot. The traditional pretzel shape is a distinctive nonsymmetrical form, with the ends of a long strip of dough intertwined and then twisted back into itself in a certain way (a pretzel loop). In modern times, pretzels come in a range of different shapes. Pretzels originated in Europe centuries before Christ's birth, although popular stories claim that the pretzel was invented by a monk to represent arms crossed in prayer to the Trinity. 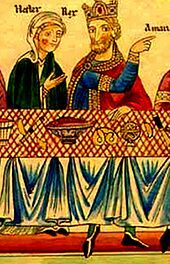 There are numerous unreliable accounts regarding the origin of pretzels, as well as the origin of the name; most assume that they have Christian backgrounds and were invented by European monks. According to legend, as cited by several sources, including The History of Science and Technology, by Bryan Bunch and Alexander Hellemans,[unreliable source?] in 610 AD "... [a]n Italian monk invents pretzels as a reward to children who learn their prayers. 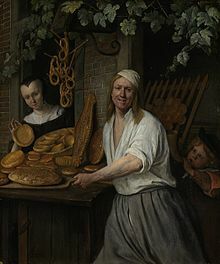 He calls the strips of baked dough, folded to resemble arms crossing the chest, 'pretiola' ("little reward[s]")". However, there is no known historical evidence to verify this claim. Another source locates the invention in a monastery in southern France. In Germany, there are stories that pretzels were the invention of desperate bakers held hostage by local dignitaries. However popular these stories have been, the pretzel's origin is pagan, and pre-dates Christianity. Meyers Konversations-Lexikon from 1905 speculated that the origin of pretzels came in a ban of heathen baking traditions, such as in the form of a sun cross, at the Synod of Estinnes in the year 743. The pretzel may have emerged as a substitute. Modern scholars identify it as a symbol of human sacrifice to a Celtic water deity named Sirona. The three holes in the pretzel represent the nooses used to kill the three people during the sacrifice. The German name "Brezel" may derive also from Latin bracellus (a medieval term for "bracelet"), or bracchiola ("little arms"). Within the Christian Church, pretzels were regarded as having religious significance for both ingredients and shape. Pretzels made with a simple recipe using only flour and water could be eaten during Lent when Christians were forbidden to eat eggs, lard, or dairy products such as milk and butter. As time passed, pretzels became associated with both Lent and Easter. Pretzels were hidden on Easter morning just as eggs are hidden today, and are particularly associated with Lent, fasting, and prayers before Easter. 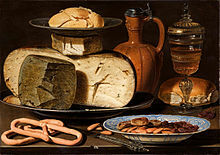 Like the holes in the hubs of round Swedish flat bread (which let them be hung on strings), the loops in pretzels may have served a practical purpose: bakers could hang them on sticks, for instance, projecting upwards from a central column, as shown in a painting by Job Berckheyde (1630–93) from around 1681. Pretzel baking has most firmly taken root in the region of Franconia and adjoining Upper German-speaking areas, and pretzels have been an integral part of German baking traditions for centuries. Lye pretzels are popular in southern Germany, Alsace, Austria, and German-speaking Switzerland as a variety of bread, a side dish or a snack, and come in many local varieties. Almost every region and even city has its own way of baking them. Examples for pretzel names in various Upper-German dialects are Breze, Brezn, Bretzel, Brezzl, Brezgen, Bretzga, Bretzet, Bretschl, Kringel, Silserli, and Sülzerli. Baked for consumption on the same day, they are sold in every bakery and in special booths or stands in downtown streets. Often, they are sliced horizontally, buttered, and sold as Butterbrezel, or come with slices of cold meats or cheese. Sesame, poppy, sunflower, pumpkin, or caraway seeds, melted cheese, and bacon bits are other popular toppings. Some bakeries offer pretzels made of different flours, such as whole wheat, rye or spelt. 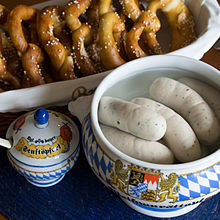 In Bavaria, lye pretzels accompany a main dish, such as Weisswurst sausage. The same dough and baking procedure with lye and salt is used to make other kinds of "lye pastry" (Laugengebäck): lye rolls, buns, croissants, and even loaves (Laugenbrötchen, Laugenstangen, Laugencroissants, Laugenbrot). Yet, in some parts of Bavaria, especially in lower Bavaria, unglazed "white" pretzels, sprinkled with salt and caraway seeds are still popular. 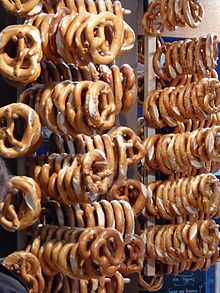 Basically, with the same ingredients, lye pretzels come in numerous local varieties. Sizes are usually similar; the main differences are the thickness of the dough, the content of fat and the degree of baking. Typical Swabian pretzels, for example, have very thin "arms" and a "fat belly" with a split, and a higher fat content. The thicker part makes it easier to slice them for the use of sandwiches. In Bavarian pretzels, the arms are left thicker so they do not bake to a crisp and contain very little fat. The pretzel shape is used for a variety of sweet pastries made of different types of dough (flaky, brittle, soft, crispy) with a variety of toppings (icing, nuts, seeds, cinnamon). Around Christmas, they can be made of soft gingerbread (Lebkuchen) with chocolate coating. In southern Germany and adjoining German-speaking areas, pretzels have retained their original religious meanings and are still used in various traditions and festivals. In some areas, on January 1, people give each other lightly sweetened yeast pretzels for good luck and good fortune. These "New Year's pretzels" are made in different sizes and can have a width of 50 centimetres (20 in) and more. Sometimes children visit their godparents to fetch their New Years pretzel. On May 1, love-struck boys used to paint a pretzel on the doors of the adored. On the other hand, an upside-down pretzel would have been a sign of disgrace. Especially Catholic areas, such as Austria, Bavaria, or some parts of Swabia, the "Palm pretzel" is made for Palm Sunday celebrations. Sizes can range from 30 cm (0.98 ft) up to 1 m (3 ft 3 in) and they can weigh up to 2.5 kg (5.5 lb). An old tradition on Palm Sunday dating back to 1533 is the outdoor pretzel market (Brezgenmarkt) in the Hungerbrunnen Valley near Heldenfingen. In the Rhineland region, sweet pretzels are made with pudding-filled loops (pudding pretzels). On Laetare Sunday in Luxembourg, the fourth Sunday in Lent, there is a festival called "Pretzel Sunday". Boys give their girlfriends pretzels or cakes in pretzel form. The size symbolizes how much he likes her. In return, if a girl wants to increase his attention, she will give him a decorated egg on Easter. The pretzel custom is reversed on Pretzel Sunday during leap years. This custom also still exists in some areas of the Swabian Alb. On the same occasion in Rhenish Hesse and the Palatinate, people have parades carrying big pretzels mounted on colourful decorated poles. During Lent in Biberach, "Lent pretzels" are popular. These are shortly boiled in water before baking and afterwards sprinkled with salt. Schloss Burg is renowned for a 200-year-old speciality, the "Burger pretzel". Its texture and flavour resembles rusk or zwieback. A local story says that the recipe came from a grateful Napoleonic soldier in 1795, whose wounds were treated by a baker's family in the little town of Burg. The cultural importance of the pretzel for Burg is expressed by a monument in honour of the pretzel bakers, and by an 18 km hiking trail nearby called "Pretzel Hiking Trail". 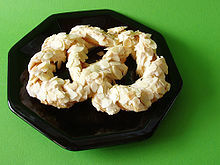 A variety typical for Upper Franconia is the "anise pretzel". The town of Weidenberg celebrates the "Pretzel weeks" during the carnival season when anise flavored pretzels are served with special dishes such as cooked meat with horseradish or roast. In the city of Lübeck, the 500-year-old guild of boatmen on the Stecknitz Canal call their annual meetings in January Kringelhöge (Pretzelfun). The elaborate affair, with about 200 participants, is celebrated as a breakfast with beer and includes Mass in the Lübeck Cathedral and a presentation of songs by a children's choir. In earlier times, the children were very poor, coming from an orphanage, and each received a Kringel (pretzel) as a reward. Hence, the name "Pretzelfun" was adopted, because this gift was considered a highlight. Today, the children come from schools, but they still get the pretzels. The city of Osnabrück celebrates the anniversary of the Peace of Westphalia (1648) and organizes an annual hobby horse race for grade-four children. On finishing the race, they are presented with a sweet pretzel. In heraldry, the city seal of Nörten dates from around 1550 and depicts two facing lions holding a pretzel at the center. 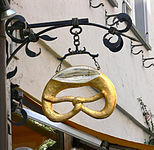 The lye pretzel is the theme for a number of festivals in Germany. The city of Speyer prides itself to be the "pretzel town", and around the second weekend of July, from Friday to Tuesday, it holds an annual funfair and festival called "Brezelfest", which is the largest beer festival in the Upper Rhine region, and attracts around 300,000 visitors. The festival includes a parade with over 100 bands, floats, and clubs participating from the whole region, and 22,000 pretzels are thrown among the crowds. On the market square of Speyer, there is a fountain with a statue of a boy selling pretzels. The pretzel booths on the main street are permanently installed and were specially designed when the whole downtown area was redone for the 2000th anniversary. One-day pretzel fests and markets in other German towns are in Kirchhellen, a borough of Bottrop, or in Kornwestheim. In 2003 and 2004, "Peace Pretzels" were baked for a UNICEF charity event and other charity purposes in Munich. Instead of the typical pretzel loop, they were made in the similar shape of a peace symbol. In the late 18th century, southern German and Swiss German immigrants introduced the pretzel to North America. The immigrants became known as the Pennsylvania Dutch, and in time, many handmade pretzel bakeries populated the central Pennsylvania countryside, and the pretzel's popularity spread. A street vendor in Union Square, New York City selling pretzels. In the 20th century, soft pretzels became popular in other regions of the United States. Cities such as Philadelphia, Chicago, and New York became renowned for their soft pretzels. The key to success was the introduction of the new mass production methods of the industrialized age, which increased the availability and quantity, and the opening up of multiple points of distribution at schools, convenience and grocery stores, and entertainment venues such as movie theaters, arenas, concert halls, and sport stadiums. Prior to that, street vendors used to sell pretzels on street corners in wooden glass-enclosed cases. In particular, the S-shaped soft pretzel, often served with brown mustard, became very popular in Philadelphia and was established as a part of Philadelphia's cuisine for snacking at school, work, or home, and considered by most to be a quick meal. The average Philadelphian today consumes about twelve times as many pretzels as the national average. Pennsylvania is the center of American pretzel production for both the hard-crispy and the soft-bread types of pretzels. Southeastern Pennsylvania, with its large population of German background, is considered the birthplace of the American pretzel industry, and many pretzel bakers are still located in the area. Pennsylvania produces 80% of the nation's pretzels. The annual United States pretzel industry is worth over $550 million. The average American consumes about 1.5 pounds (0.7 kg) of pretzels per year. The privately run "Pretzel Museum" opened in Philadelphia in 1993. In 2003, Pennsylvania Governor Ed Rendell declared April 26 "National Pretzel Day" to acknowledge the importance of the pretzel to the state's history and economy. Philly Pretzel Factory stores offer a free pretzel to each customer on this day. Hard pretzels originated in the United States, where, in 1850, the Sturgis bakery in Lititz, Pennsylvania, became the first commercial hard pretzel bakery. Snack food hard pretzels are made in the form of loops, braids, letters, little pretzels, or sticks around 3 millimetres (1⁄8 in) thick and 12 centimetres (5 in) long; they have become a popular snack in many countries around the world. A thicker variety of sticks can be 1.5 centimetres (1⁄2 in) thick; in the U. S. these are called Bavarian pretzels or pretzel rods. Unlike the soft pretzels, these were durable when kept in an airtight environment and marketable in a variety of convenience stores. Large-scale production began in the first half of the 1900s, more so during 1930 to 1950. A prime example was in 1949, when highly innovative American Machine and Foundry Co., of New York City, developed the "pretzel bender": a new automatic crispy-styled baked pretzel-twisting machine that rolled and tied them at the rate of 50 a minute—more than twice as fast as skilled hand twisters could make them—and conveyed them through the baking and salting process. In Europe, snack-food pretzels are usually sprinkled with salt, but also with sesame seed, poppy seed, or cheese. In the U.S., they come in many varieties of flavors and coatings, such as yogurt, chocolate, strawberry, mustard, cheese and others, and chocolate-covered hard pretzels are popular around Christmas time and given as gifts. The variety of shapes and sizes became contest of imagination in the marketing of the pretzels taste. During the 1900s, people in Philadelphia would use the small slender pretzel stick as a common accompaniment to ice cream or would crumble pretzels as a topping. This combination of cold sweet and salty taste was very popular for many years. Eventually, this led to the development of an ice cream cone tasting like a pretzel. More recently Mars, Incorporated manufactures M&M's with a small spherical pretzel covered in milk chocolate and candy coated in all of the standard M&M's colors, called "Pretzel M&M's". Soft pretzels are frequently sold in shopping malls, with notable chains including Auntie Anne's and Pretzelmaker/Pretzel Time. Southern German and Swiss German immigrants who became known as the Pennsylvania Dutch introduced soft shaped pretzels with different shapes and pretzel bakery businesses. Sturgis Pretzel House in Lititz, Pennsylvania, becomes the first commercial hard pretzel bakery in the United States. The Anderson Pretzel Factory in Lancaster, Pennsylvania, is founded. Today, it calls itself the world's largest, producing 65 tons of hard pretzels daily. The Reading Pretzel Machinery Company in Reading, Pennsylvania, introduced the first automatic hard pretzel twisting machine. The largest soft pretzel of its time, weighing 40 pounds and measuring 5 feet across, is baked by Joseph Nacchio of the Federal Pretzel Baking Company for film It's a Mad, Mad, Mad, Mad World. The first machine-produced stamped cut soft pretzel was innovated at Federal Pretzel Baking Company. The first Pretzel Museum of soft pretzels is opened in Philadelphia. A 7-minute film, demonstration of championship hand twisting at 57 per minute and tasting were highlights. Pennsylvania Governor Ed Rendell declares April 26 as National Pretzel Day to acknowledge the importance of the pretzel to the state's history and economy. Freeport, Illinois, which sits about 100 miles outside of Chicago, is another city known for its rich pretzel history. In 1869, a German immigrant named John Billerbeck established the first Billerbeck Bakery which was known for selling German style pretzels to compliment the large number of breweries that existed in Freeport during this time. Prohibition eventually shut down the breweries which led to the decline of pretzel sales in Freeport, but the city never lost its pretzel pride. For more than 100 years, Freeport has been known as "Pretzel City, USA." Their high school athletic mascot is the Pretzel and the football stadium has been appropriately named "Pretzel Field." In 2003, local citizens launched Freeport's first Pretzel Festival which is a large community event where residents get together to celebrate the city's pretzel history. Contestants are chosen to be crowned Pretzel Prince and Princess and a festival mascot by the name of "Pretzel Bill" (stemming from the Billerbeck Bakery name) dresses as a 6-foot tall walking talking pretzel who hands out pretzels from floats and takes photos with the local festival goers. Although not as popular as among German speakers and Americans, the looped pretzel is known in other European countries and in other countries around the world. In the Czech Republic, the pretzel is known as preclík, in Finland as viipurinrinkeli, in Slovakia, it is called praclík. The Spanish, French call it bretzel, the Italian brezel, the Dutch favor sweet variants called krakeling, Norwegian and Danish call it a kringle, and the Swedish call it kringla. In Polish it is precel, in Hungarian and Croatian it is perec, and in Serbian it is pereca. In Romania, the pretzel is known as a variety of covrigi and it is a very popular fast food in urban areas and also as a holiday gift. The pretzel has become an element in popular culture, both as a food staple, and its unique knotted twist shape which has inspired ideas, perspectives, attitudes, memes, images, and other phenomena. Although historically, the pretzel has influenced culture, it has recently been heavily influenced by mass media. Landscape architecture and sculpture memorialized the strong identity that the city of Philadelphia had with pretzel cuisine of local bakers and popularity in Philadelphia. The Philadelphia Recreation Department renamed in 2004 a facility formerly identified as Manayunk Park, located on the 4300 block of Silverwood Street as "Pretzel Park." The re-designed park includes pretzel-like looped pathways and a public art statue in the shape of a pretzel sculpted by Warren C. Holzman. Municipal government adopts pretzel logo as trademark by the City of Freeport, Illinois, also known as "Pretzel City USA". Dance steps developed in swing dancing became the "pretzel dance move", which dates back to the 1920s. Furniture design-inspired Pretzel Chair designed in 1952 by George Nelson. Amusement ride of the Pretzel Loop design in roller coaster elements maximizes the g-forces on riders, increasing the "thrill element" of riding a roller coaster. On a pretzel loop, riders are upside down at the beginning, and on their backs and going backwards at the bottom. Fashion-inspired sling bikini is a pretzel bathing suit design emerging in the early 1990s, as a new fashion product of Spandex. It is a bikini variant, haltered maillot that crisscrosses the front and fastens to the waistline. With the advent of the 1990s fabric known as Lycra, these bikinis first emerged and became most popular on the beaches of Europe, including Saint-Tropez, Marbella, Mykonos, and Ibiza. Ecosystem ecology The "SolVin-Pretzel" because of its shape was the name given to the inflatable United Nations Global Canopy Programme's light weight research platform which is placed on top of the canopy of rainforests to study the ecology below. A circulating internet video shows a press conference of US president George W. Bush from January 2002, in which he recalls choking on a pretzel: "When you're eating pretzels, chew before you swallow. Listen to your mother." 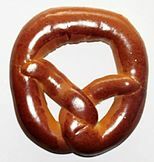 Wikimedia Commons has media related to Pretzels. ^ Miller, Jeffrey (26 April 2018). "How the pretzel went from soft to hard – and other little-known facts about one of the world's favorite snacks". The Conversation. Retrieved 26 April 2018. ^ a b c d Parks, Shoshi (2019-02-28). "The 1970s Movement to Reclaim Pretzels for God". Atlas Obscura. Retrieved 2019-03-09. The pretzel's origins actually predate Christianity by hundreds of years. Their twisty shape is a symbol of Sirona, the Gaulish goddess of spring and the sacrificial rites associated with the harvest. While the PFG [Pretzels for God] saw the Holy Trinity in the holes of the pretzel, [food historian William Woys] Weaver says the pretzel's form is "a votive symbol of a triplicate noose, the type used to hang three people at once, since three deaths were considered more potent than one." ^ a b Silverman, Sharon Hernes (2001). Pennsylvania Snacks. Stackpole Books. p. 30. ^ Hartel, AnnaKate (2008). Food Bites. Springer. p. 111. ISBN 0-387-75844-5. ^ Grunes, Barbara (2007). The Best Bake Sale Ever Cookbook. Chronicle Books. p. 80. ISBN 0-8118-5075-7. ^ a b c Michael Gruenert (2009-08-23). "Brezelgeschichte, Brezelhistorie, Brezel, Geschichte, Historie". Brezel-baecker.de. Retrieved 2010-08-18. ^ E.g. OED s.v. : "[G. pretzel, bretzel, in OHG. brizzila = It. bracciello Florio) a cracknel; usually taken as ad. med. L. bracellus a bracelet; also a kind of cake or biscuit (Du Cange)]"
^ SAUNDERS, Fr. William. "Lenten Pretzels". CERC. Retrieved 16 May 2012. ^ "230835/Herst.Laugengeb_Inhalt" (PDF). Retrieved 2010-08-18. ^ "Palmbrezel". Brezel-weber.de. Retrieved 2010-08-18. ^ Michael Gruenert (2009-08-23). "Brezelgeschichte, Brezelhistorie, Brezel, Geschichte, Historie". Brezel-baecker.de. Retrieved 2010-08-18. ^ a b Michael Gruenert (2009-08-23). "Brezelgeschichte, Brezelhistorie, Brezel, Geschichte, Historie". Brezel-baecker.de. Retrieved 2010-08-18. ^ gekapanne (2008-07-30). "Wandern: Der Brezel-Wanderweg um Schloß Burg (Tour 31536) - Tourenblatt". Gps-tour.info. Retrieved 2010-08-18. ^ "Kringelhöge 2008". Rondeshagen.com. Retrieved 2010-08-18. ^ "Büro für Friedenskultur | Steckenpferdreiten". Osnabrueck.de. Retrieved 2010-08-18. ^ "Nörten-Hardenberg - Heraldry of the World, Wappen, Gemeindewappen". ngw.nl. Retrieved 2014-02-22. ^ "Geschichte". Verkehrsverein-Speyer. Archived from the original on 2010-03-15. Retrieved 2010-08-18. ^ fresenius. "Brezelfest". speyer.de. Archived from the original on 2010-11-28. Retrieved 2010-08-18. ^ "Druckversion speyer.de | Das Brezelfest". Speyer.de. 2001-10-02. Archived from the original on 2011-06-10. Retrieved 2010-08-18. ^ "Brezelfest in Kirchhellen". Brezelfest.de. Retrieved 2010-08-18. ^ "5.Kornwestheimer". Brezelfest mit Blasorchester Egerland & Egerländer-Gmoi Kornwestheim-Ludwigsburg,. Moderation Elvira Saverschek. Retrieved 2010-08-18. ^ "UNICEF — Peace Brezn". muenchen.de. Retrieved 2010-08-18. ^ "peacebrezn.de". Seggl.de. Archived from the original on 2012-09-18. Retrieved 2010-08-18. ^ a b c "The History of the Pretzel". Kitchenproject.com. 2008-07-21. Archived from the original on 2011-01-01. Retrieved 2010-08-18. ^ a b c d "The Pretzel Museum". Ushistory.org. Retrieved 2010-08-18. ^ a b Elaine Dann Goldstein (1988-11-13). "New York Times, Lead, November 13, 1988". Pennsylvania; Philadelphia (Pa): New York Times. Retrieved 2010-08-18. ^ "Historical Photo Archives of Philadelphia Pretzel Vendors". Phillyhistory.org. Retrieved 2010-08-18. ^ "Pretzel Museum". Ushistory.org. Retrieved 2010-08-18. ^ "National Pretzel Day, April 26". Reuters.com. 2008-04-24. Archived from the original on 2009-01-10. Retrieved 2010-08-18. ^ "Reuters top ten news". Reuters.com. 2008-10-01. Archived from the original on 2009-09-25. Retrieved 2010-08-18. ^ "Lancaster, Pa. Newswire". Reuters.com. 2008-10-01. Archived from the original on 2009-09-25. Retrieved 2010-08-18. ^ a b "National Pretzel Day, April 26th". Reuters.com. 2008-04-24. Archived from the original on 2009-01-10. Retrieved 2010-08-18. ^ "Free soft pretzels for National Pretzel Day". philly.com. Retrieved 2011-09-10. ^ "Machine Speeds Pretzel Bending | Modern Mechanix". blog.modernmechanix.com. Retrieved 2014-02-22. ^ "The Anderson Pretzel Bakery". Rambles.net. Retrieved 2010-08-18. ^ "RootsWeb's WorldConnect Project: The Horner Family Of Carroll County, Illinois (And Nearly Everyone Else)". ^ "Let's twist again". Chicago Tribune. ^ "Memes in popular culture". Oracle Thinkquest. Retrieved October 1, 2010. ^ "Pretzel Statue". Philly Public Art. Retrieved 2010-08-18. ^ "Manayunk Council Local Park History". Manayunkcouncil.org. Retrieved 2010-08-18. ^ "City of Freeport, Illinois, Visiting Freeport". Ci.freeport.il.us. Retrieved 2010-08-18. ^ "Basic Swing: Pretzel Dance Move Tutorial". YouTube. Retrieved 2012-02-20. ^ "Images of spandex pretzel design Bikini". Bikiniscience.com. Archived from the original on 2010-08-16. Retrieved 2010-08-18. ^ "Bush press conference". YouTube. Retrieved 7 February 2012. Moskin, Julia (May 25, 2010). "Making Soft Pretzels the Old-Fashioned Way". The New York Times. Retrieved 2010-08-18.